It has been a busy week with lots of interesting cases, cold weather and eventful happenings. It is hard to believe it is March. The temperature has been less than perfect. We have had several nights of below zero F. temperatures several in the eighteen and twenty below zero F. range with lots of snow. Most of the country is having unusual weather so we are trying not to grumble. Lets just say we will be delighted to see spring! 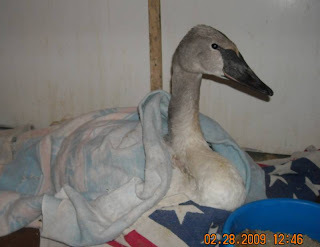 Lead poisoned Trumpeter Swans continue being admitted. 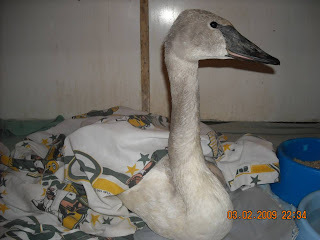 The newest patient Photos) is a cygnet or young swan. She will be a year in late May or June. Just like in the story the UGLY DUCKLING, cygnets are gray and some think not as attractive as their perfectly white parents. It is hard to see a little one so sick. She has lead poisoning. 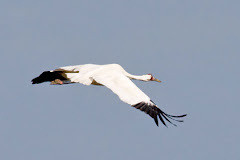 There was a concentrated effort to capture her during the past several weeks at the wintering area near Hudson. WI. The folks in Hudson and the Crex Meadows swan capture crew are amazing and keep a close watch on the wild swans as they winter in the area. This little lady managed to evade capture until a few days ago. By that time she was so weak that she could no longer move. She came in weighing less than 10 lbs. That is critical starvation mode for this large species. Females swans should weigh 22 lbs and males up to 35lbs. That is comparable to a 120 lb person weighing 55 lbs. The good news that while she remains very sick she has gained 2 lbs in the past few days. She is being tube fed a mixture rich in nutrients and calories. She is injections for lead poisoning and medication for aspergillosis. Aspergillosis is a fungal condition that takes advantage of a bird with a compromised immune system. Aspergillosis is often fatal so we are being very careful with her and leaving nothing to chance. She is also on a heating pad to maintain her body temperature. Lead poisoning causes a host of problems including neurological issues and every organ of the body. These cases are so fragile and labor intensive but the success of released back to the wild is wonderful. It makes it all worthwhile for us and for the swan population. 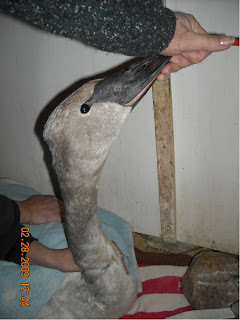 PHOTOS left tube feeding cygnet swan when admitted. Photo left above cygnet on first day and right last night. Notice how much more alert she is after a few days of treatment for lead poisoning and tender loving care. Also notice that she is wearing a Green Bay Packer sheet on her shoulders. ::) We are often given old sheets or towels to use with the birds. I wish the youngster that owned that sheet could see it now! Heck I wish the Green Bay Packers could see her too! Their fan base has grown to include endangered species! How great it THAT?